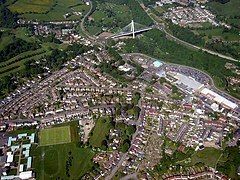 Blackwood (Welsh: Coed Duon) is a town, community and an electoral ward on the Sirhowy River in the Valleys of Wales administered as part of Caerphilly County Borough. It is located within the historic county of Monmouthshire. In 1912 the Titanic's distress signals were picked up by amateur wireless enthusiast Artie Moore who resided at the Old Mill, Gelligroes, just outside the town. Moore went on to work as a senior scientist for Marconi and was involved with the invention of the transistor for telecommunications. The decline of the coal mining industry throughout the later part of the twentieth century affected South Wales, the major source of employment was lost and the landscape left daily reminders of what had been. State backed rejuvenation schemes have gone some way to rejuvenate the wider Blackwood area, including the relief road and various light industrial areas. In sport, Blackwood has two rugby union and one rugby league sides, all of whom play at Glan-Yr-Afon Park. The rugby union sides are Blackwood RFC, established in 1889, and Blackwood Stars RFC, originating c. 1920. The rugby league club is called the Blackwood Bulldogs and plays in the Welsh Conference Premier. Rugby players Kevin Moseley, Alun Pask and Alun Lewis hail from the town. The Boys' Brigade and Girls' Brigade are in Blackwood with companies meeting at the Baptist and Methodist churches, there are also a number of Christian youth groups. There is a network of primary schools, junior schools and secondary schools. The town is provided for by three local comprehensive schools all with between 800 – 1000 pupils. The Secondary schools are Blackwood Comprehensive School, Pontllanfraith Comprehensive and Oakdale Comprehensive. Until the mid-1990s Blackwood comprehensive had separate uniforms for senior and junior pupils. A number of Blackwood pupils have been to Oxbridge and to other leading educational institutions. An increase in demand for Welsh language medium education has led to the establishment of two Welsh Medium Infants and Primary schools. Ysgol Trelyn is located in the community of Pengam to the west of Blackwood and the newly opened Ysgol Cwm Derwen is located in the village of Oakdale to the east of the town. Both schools are 'feeder' schools to the Secondary School Ysgol Gyfun Cwm Rhymni located in Fleur de Lys, a village adjacent to Pengam to the west of Blackwood. Blackwood is in the middle of the Sirhowy Valley, the source of the river near Tredegar to the North and the confluence with the River Ebbw to the South. The main road to Blackwood and for traffic heading North or South was through Blackwood High Street (B4521), until the Sirhowy Enterprise Way was opened in 2005. Sirhowy Enterprise way was 4.3km of new single carriageway roads following the former Pennar Branch railway line (closed 1989) on the Eastern Side of the valley, connected by the Chartist Bridge to the North and a bridge linking Woodfieldside to Blackwood in the south. The new roads which link to the A472 and the A467 provide links with Newport and other major towns and have closed off local roads such as the 1 in 4 incline of the Rhiw. Blackwood has no heavy or light rail links, local bus services run between Blackwood Bus Station and Ystrad Mynach with a link to the Transport for Wales, Rhymney Line. Blackwood appears in the preliminary South Wales Metro plan published by Transport for Wales as being a possible extention to the rail links. The Sirhowy Tramroad, which was constructed in 1797, ran through what is now High Street. The tramroad was converted to a standard-guage Railway in 1860 and was taken over by The London & North Western Railway (LNWR) in 1876 which was incorporated into The London, Midland & Scottish Railway (LMS) in 1923. Passenger services ran from June 1865 until June 1960, Mineral traffic to coal yards at Blackwood & Tredegar continued until April 1969 with track lifted the following year. Some evidence of the railway still exists such as the underpass at Cwmgelli, most of the line is now a cycle path. The site of Blackwood Railway Station is now occupied by KFC. IBT - Islwyn Borough Transport: IBT (originally established in 1926 as the West Monmouthshore Omnibus Board) was the former municipal operator and served routes in the Islwyn Borough Area (Bedwellty and Mynyddislwyn) with the main depot next to St Margaret's Church, Blackwood. Later moving to a new depot on Penmaen Road Pontllanfraith; a depot that is still occupied by IBT's successor organisation. Following deregulation, its IBT traded as an arms' length operation of Caerphilly County Borough Council. Its distinctive blue and white livery was transferred from its Leyland Tiger and Leyland Leopard buses (which were a common sight until the early 21st Century) to their low floor fleet. However, in late 2009 Caerphilly resolved to sell IBT to Stagecoach in South Wales. The sale was approved by the Office of Fair Trading and took place on 12 January 2010. Glyn Williams: Glyn Williams sold out to Stagecoach in 2005. The Rotary Club of Blackwood was formed in 1946 and currently has seventeen male members and one female member. The Club meets every Tuesday at Maes Manor Hotel and is active in the local community. The Club raises funds for various charities and supports extra curricular activities in local schools. In early August 2014 Blackwood's Maxime cinema reopened its doors after being purchased by new owners and after being given an extensive refit. On 5 August the Rotary Club of Blackwood hosted the cinema's gala opening evening. The film chosen for this event was the aptly named Blackwood, a 2014 ghost story from an independent production company. The Club's 2018 president was Trevor Morgan, a local clergyman. Blackwood is currently represented on Caerphilly County Borough Council by three Independent councillors: Kevin Etheridge, Andrew Farina-Childs and Nigel Dix. James Dean Bradfield, Richey James Edwards, Sean Moore and Nicky Wire all grew up in the town and attended Oakdale Comprehensive School nearby, forming the influential rock band Manic Street Preachers. Bradfield and Wire have since also released solo material. Siobhan Dowd author, lived in Blackwood between 2000 and 2003. Sam Gardiner, Irish politician, lived in Blackwood for a number of years. Evan James writer and composer of Welsh National Anthem was from Argoed on the outskirts of Blackwood. Neil Kinnock former leader of the Labour Party was Blackwood's local MP (for the former parliamentary constituency of Bedwellty) from June 1983 to February 1995 and lived in the town during part of that period. Welsh noise rock group mclusky formed after meeting at Blackwood Miner's Institute. Dame Margaret Price opera singer. Songdog are another notable local act. GrahameTanner—co-author of five books on the Swansea Cambrian Pottery(1764-1870). ^ "Ward/Community population 2011". Retrieved 5 November 2015. ^ Shelton, Andrew. "Blackwood Town Cricket Club". Btcc-cricket.co.uk. Retrieved 2014-07-27. ^ "Cinema Information". Blackwoodcinema.co.uk. Retrieved 27 July 2014. ^ "History of St Margarets Church". churchinwales.org.uk. Archived from the original on 23 April 2013. Retrieved 11 March 2013. ^ Mitchell & Smith (2007). Sirhowy Valley Line. Middleton Press. ISBN 9781906008123. ^ info@121technology.com, Chris Sweeney, Rotary Club of Conwy. "Completed meetings and events - Rotary Club of Blackwood". rotary-ribi.org. ^ "Blackwood". 1 August 2014 – via IMDb. ^ info@121technology.com, Chris Sweeney, Rotary Club of Conwy. "The team - Rotary Club of Blackwood". rotary-ribi.org. ^ "Home". Blackwoodlabour.org.uk. Archived from the original on 2014-08-09. Retrieved 27 July 2014. Wikimedia Commons has media related to Blackwood, Caerphilly. This page was last edited on 11 March 2019, at 12:14 (UTC).